Did your computer mouse suddenly stop working in middle of some important task? 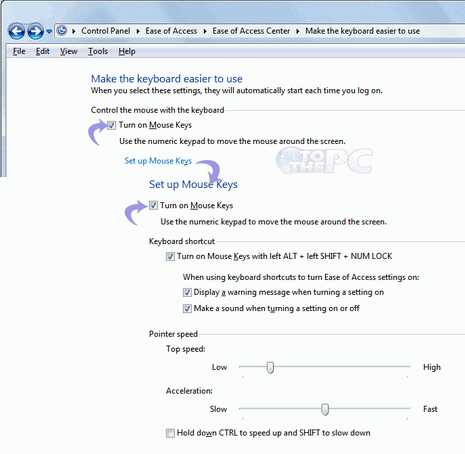 No need to look for another mouse, as you can control mouse pointer using keyboard. Numeric keys on the keypad on the right side can be used to control mouse pointer on Windows 7 PC. This feature can be used to complete current work and you can arrange for new mouse later on. 1. Open control panel & click on Ease of Access option. 2. Now click on change how your keyboard works. 3. Select the Turn on mouse keys checkbox. 4. If you want to make some changes to the keys performance like the speed on pointer speed and all other setting by clicking on the setup mouse keys. 5. When you are done with all the setting click on Apply & OK.
Now you can move the mouse pointer with the numeric keys on the keyboard. You can not write numbers with the numeric keys till the mouse keys feature is turned ON. How many Mouse Clicks & Key Press you have made?